Norwich goalkeeper John Ruddy could miss up to three months of action after suffering a thigh injury, the club have confirmed. 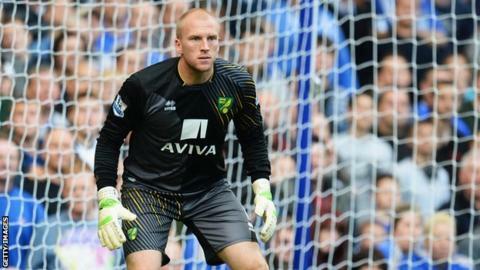 Ruddy, 26, tore his thigh against former club Everton on 24 November. It is the second time in a year Ruddy has suffered disappointment through injury after he withdrew from England's Euro 2012 squad with a broken finger. He eventually made his England debut in the 2-1 win over Italy in August, keeping a second-half clean sheet. "Just to update everyone on my injury, unfortunately I have torn my thigh and will be having surgery on Saturday and out for up to three months," Ruddy posted on Twitter. He joined Norwich from Everton for a fee of £250,000 in July 2010 and helped the Canaries gain promotion to the Premier League in his first year at the club. After finishing 12th in the Premier League last season, Ruddy was rewarded for his fine displays with a new four-year deal in June.